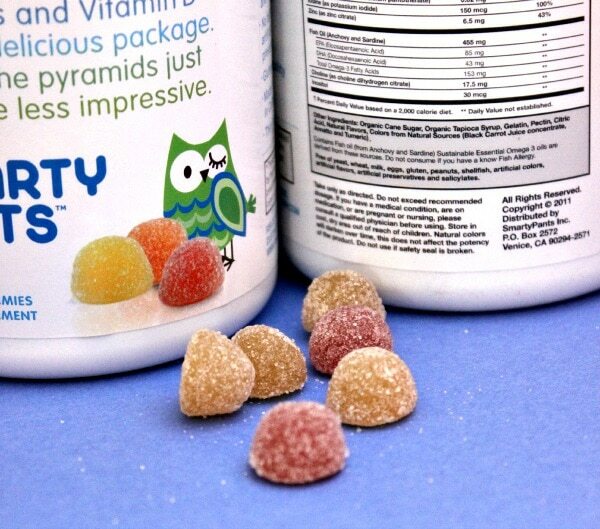 SmartyPants makes gummy vitamins for adults. I was sent bottles to try out. All opinions are my own. I will admit I miss the chewable vitamins from my childhood. I can remember so looking forward to my daily dose of deliciousness and always wanting more. Well, now there are gummy vitamins made just for adults. The aptly named, SmartyPants, has created a complete multi-vitamin for adults in a tasty gummy form. Adults Can Have Gummy Vitamins, Too! 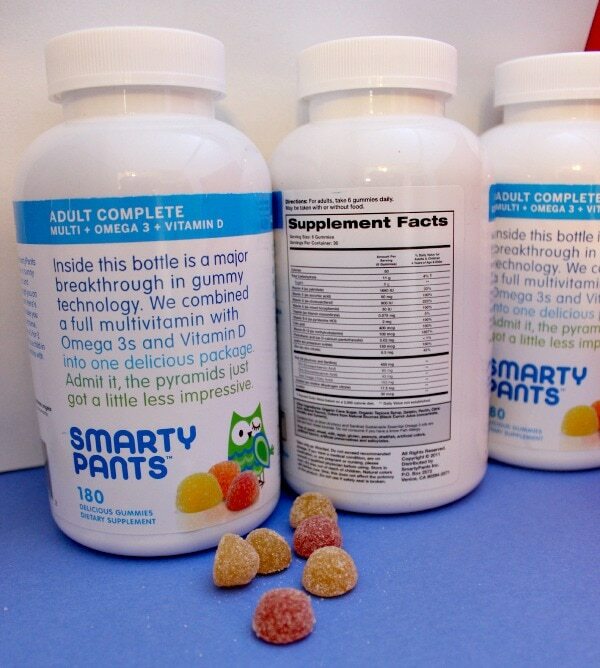 SmartyPants has a full line of gummy vitamins for both kids and adults. We received the Adult Complete. They combined a full multivitamin with Omega 3s and Vitamin D into a deliciously gummy package. Excellent source of Omega 3s DHA & EPA, Vitamin C, D3, E, B6, B12 and folic acid. Made in a GMP-certified facility in California. Adults are instructed to take 6 gummies daily. That’s awesome because they are too yummy to eat just one! Made with organic and eco-friendly ingredients and only 50 calories per serving, it’s a tasty way to get your daily nutrients. SmartyPants has a partnership with Vitamin Angels which means they are a company that gives back. Purchasing from them helps vitamin-deficient children around the world. I often forget to take my daily vitamins, but not with these. It’s funny how I look forward to my daily dose of adult gummy vitamins instead of dreading to swallow my old supplements. If you are an adult who hates swallowing vitamins, I suggest trying adult gummies. They are much easier to chew and pleasant to eat. I like to eat my gummy vitamins in the afternoon around the 3:00 pm slump that typically occurs. I get a tiny boost of energy that helps me power through until dinner. That is around the same time of day where I crave a snack. The gummies double as a tasty little treat and my vitamins, so it works out well. Mike and I both think the SmartyPants gummy vitamins taste great. Believe it or not, this is the only way that I can assure that my husband will take a multivitamin. He says they taste like Dots – one of his favorite candies. And, I definitely look forward to my daily dose. It’s like eating candy without the guilt. There are Smarty Pants options for kids, too. Something for the whole family! Get Your Smarty Pants Now! Find SmartyPants at your local CVS or check their store locator for other retailers. You can purchase online through the SmartyPants website or on amazon.com. Make sure to check out each one of their varieties and stay tuned for more. I am extra excited about the Weight Management Complete and plan to try that next. Do you take daily vitamins? Do you think you would like adult gummy vitamins? I have a hard time taking vitamins (like actually wanting to take them) I would probably actually look forward to these!! They look like a treat! These sound fantastic! I think that these will help me to get everyone in my family to take their vitamins without complaining! I saw a commercial for these vitamins the other day and I wondered how they tasted. I will add them to my shopping list. I didn’t know they made an adult version!! We love our kids one!! I love gummy vitamins. Sometimes I just do not feel like swallowing so many vitamins and pills. This would be super to try. These sound wonderful! I hate taking vitamins so this would be great for me. I think these are a great ideas. Might be good for my teens too! I should try these. I know I do not get all of my vitamins. Thanks for sharing this, I’m always looking for more gummies! I take vitamins daily and these look tasty!